AUSTRALIA Vending Machine Companies! Australian vending machine companies offering: Snack, Soda, Drinks, Coffee, Food, Deli, Frozen, Ice Cream, Water, Healthy vending machines, Micro Markets, Amusement Games, Coin Operated Machines, repair services & more! These vending companies are listed in alphabetical order by company name, please contact them direct for more information on their vending machine equipment, services & products. The Big Bottle Water Vending machine has features to draw customers away from the competition, and will keep them coming back. Patented self-advertising design, Machine monitoring detects faults and tracks cash flow, 200 litre internal water storage tank, Machine can produce up to 95 litres per hour! 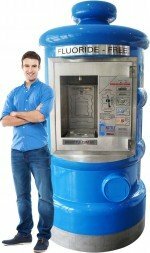 To learn more about this exciting Bottle Water Vending Machine -visit website at: Big Bottle Vending TO DOWNLOAD INVESTORS’ GUIDE! Kooler Ice Australia – Ice and water vending machines are a proven income generator; just think about the service station industry and the changes it has undergone in the last 30 years. They have one feature that has stood the test of time – Ice machines. A Kooler Ice Kiosk is doing business 24/7 – without staff. The bagged ice is made on site by the machine – no ice deliveries or running out of stock. Minimal time and maintenance – Kooler Ice machines are designed to be unbelievably low-maintenance. Your business will immediately generate cash flow. Contact us today to find out how! Vendwest Australia. Perth based Vending Machine distributors & providers. Sole W.A distributors for AP, Royal and Azkoyen drink, snack, combo, real food, frozen food, cigarette & coffee vending machines. Also Australian agents for the amazing “Green Machine Ice Vending Kiosks” and the unique “Oranfresh” freshly squeezed orange juice vending machines. Vending machines to rent, buy or supplied free to workplaces and public venues. Interesting fully equipped showroom in Booragoon, Perth, Australia.